Presumptive Republican presidential nominee Donald Trump insists his hair is real. Maybe, if he's elected, he can send a lock to historian Robert Peck to prove it. Peck, a senior fellow at the Academy of Natural Sciences, has already written to the White House seeking a snippet from Barack Obama to add to the collection "Presidential Archives: Letters, Hair, and Fossils," which includes hair from past presidents and will be on display at the Academy from July 1-29. 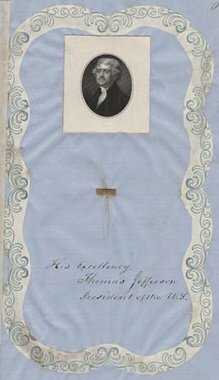 A sample of Thomas Jefferson's hair. The ringlet, as well as hair from several past presidents, will be on display at the Academy of Natural Sciences from July 1-29. Philly attorney and "all-around hair enthusiast" Peter Arrell Browne (1762-1860) collected locks from several American presidents — from the wig-less George Washington to the wily sideburns of Martin Van Buren — during his lifetime. According to Peck, the practice of collecting hair wasn't so creepy unusual centuries ago. “It may seem like an odd hobby today, but it was quite common for people to keep hair clippings from their loved ones in lockets, brooches, rings, and pins in Victorian times,” Peck said in a news release. The collection will get its close-up the same month the Democratic National Convention comes to Philly from July 25–28. Peck is hoping to get some of those pearly white ringlets from Bill Clinton when he accompanies wife and Democratic front-runner Hillary Clinton. “My shears are ready, if our former president is willing," Peck said. Samples of presidential hair can be viewed here, and more on the exhibit can be found here.